I'm so excited that Mama Gaia — Memphis' totally organic vegetarian restaurant — now has vegan cheese for their pita pizzas. I stopped by the Crosstown location last week for lunch takeout (after my lunchtime yoga class at the Church Health YMCA) and got the Copia Petitizza (with mushrooms and vegan cheese). I first tried Mama Gaia's vegan cheese petitizzas at their Ballet Memphis location, and it was delicious. But the vegan cheese gets way meltier at the Crosstown location because they have a better oven there. Good to know! This pizza was perfect. Speaking of pizza, here's another "pizza" I ate. My friend Misti had her birthday brunch at Majestic Grill this past Saturday. 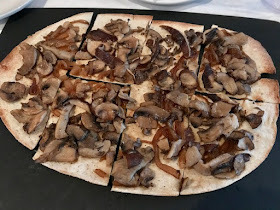 It's not the most vegan-friendly restaurant (though they do have a veggie plate option at dinner), but a few of us vegans were able to order flatbreads with no cheese from the brunch menu. I went with the Wild Mushroom Flatbread. This had garlic olive oil and a nice mix of mushrooms and caramelized onions. Really yummy! 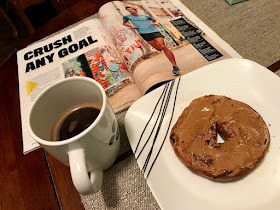 Before that brunch, I ran a 12-mile training run, so I started the morning with my fave pre-long run meal of a Cinnamon Raisin Dave's Bagel with Cookie Butter. Yay for carbs and fat! Plus coffee for added energy. Here's a Cactus Pear Agave Ice Pop from MEMPopS in Crosstown Concourse. Love that color! And here's another pink thing I ate (or, well, drank). 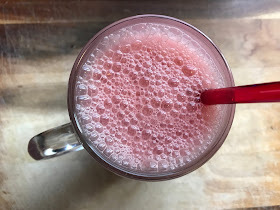 This morning, after my 4-mile run, I had this Morning Sunrise Smoothie with fresh-squeezed grapefruit juice, frozen strawberries, and VeganSmart Peaches & Cream protein powder. Friday morning's breakfast was a steamy bowl of I Heart Keenwah Toasted Quinoa Hot Cereal with YumButter Protein Almond Butter, Bee-Free Honee, & Raspberries. I'm not a huge fan of fall because it feels like a prelude to winter. Sure, the leaves are pretty, and my birthday and Halloween (my two fave holidays!) are in fall. But it's hard to get excited about summer ending. However, there is one thing that makes fall okay in my book — PUMPKIN SPICE! I found this giant bottle of Silk Pumpkin Spice almond creamer, and it's totally been taking my coffee to the next level. That pop looks so refreshing and colourful! It is heating up here now, I want one! That pizza and the mushroom flatbread are seriously drool worthy! Caramelized onions make anything better! I'm usually with you on the fall feeling, and while I don't want winter after this too hot summer I am loving the cooler weather. I need pumpkin spice almond creamer! I've never seen that anywhere, I'll have to keep my eye out for it! OMG! The pizza from Mama Gaia looks so perfect. I wish I was eating pizza right now! That does look like an awesome cheesy pizza! I'm so particular about my coffee (i make it with a Bialetti on the stove) but once in a while i like a flavored creamer- ever since i discovered the plain Califa creamer that's really my favorite. I have never seen a silk brand almond coffee creamer of any flavor! I live for your comments!! Seriously. I'm waiting right now for you to write something.